The Melgaço Museum of Cinema - Jean Loup Passek, inaugurated in 2005 by the then Minister of Culture Isabel Pires de Lima, is located in the heart of the historical city centre, at the old fiscal police building, bought and adapted with that purpose. The Museum, which is based on the estate collected throughout his lifetime by frenchman Jean Loup Passek and donated to the municipality, has two exhibitions, permanent and temporary, distributed across the building's two floors. The permanent exhibition, located on the ground floor, is dedicated to Pre-Cinema, ie, the period before the cinematograph of the Lumière brothers. Here the visitor will be able to enjoy several devices like magic lanterns with the respective boxes and hand-painted glass plates, phenakistoscopes and its discs, zoetropes and praxinoscopes, and also one of the first film posters advertising cinema in theaters, along with other examples of the evolution of cinema from its origins until the appearance of the cinematograph. 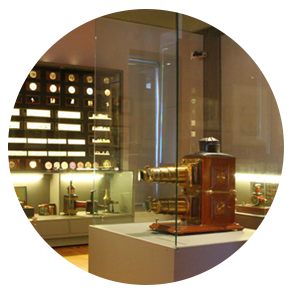 These pieces of equipment became extremely popular with the public in the XIX century, since they used the optical capacity to "store in memory" an image that appears very briefly (a tenth of a second is enough). By chaining the images that make up an action, an impression of continuity is produced between the images separated by a black interval: thus creating the illusion of movement.